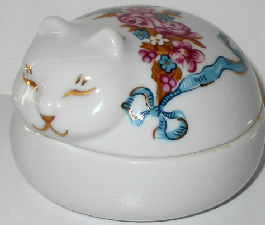 This little trinket box is also a fragrant candle. The round ceramic box is decorated with images of roses, ribbons and is accented with gold detailing. The box is 3 1/4" wide x 2 1/4" high. Previously owned but in good condition.